I like trying out new tools and apps. 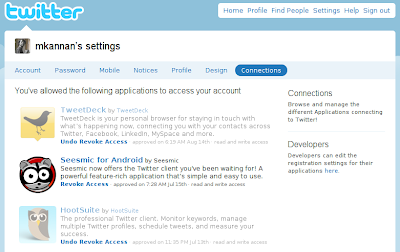 One thing I like about Twitter is that there are plenty of Twitter clients out there. We have a lot of choice in choosing a client that suits our needs and preferences. I keep trying various Twitter clients every now and then. The best part about OAuth is that when you stop using an app, you can revoke the permissions you gave to that app. (You can do that from Twitter Connections settings.) If you had shared your password with an evil person or app, your only choice is to change the password. Today I was casually going through my Twitter settings and found that I had authorized many third party clients to tweet on my behalf. I had stopped using most of those clients, but I didn't know that these permissions are persistent (i.e. authorizations persist even after we uninstall the clients). 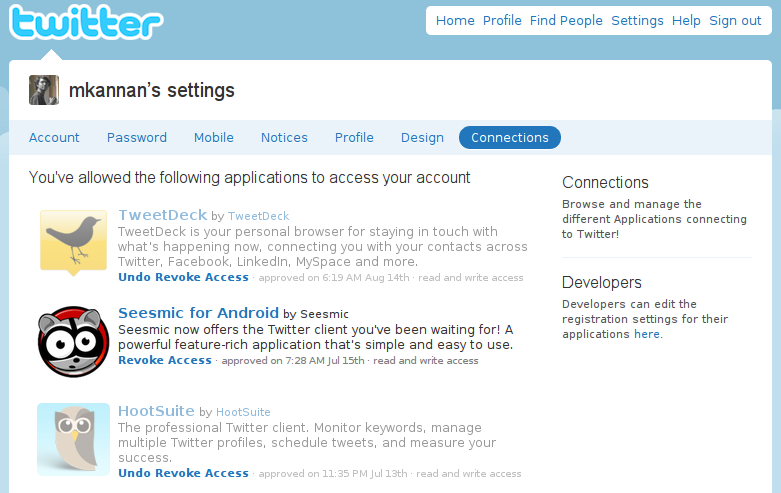 Leaving only the clients that I use currently, I revoked access to all other clients. You also go ahead to Twitter Connections and remove unwanted apps from there. PS: Facebook scene is probably worse since you would have unknowingly authorized many Facebook apps. See my previous post to learn more. @Mehar: I am seeing this app only now. The console looks neat. Will be very useful when developing something using an API.